Bienvenue à notre condo non-fumeur, toutes saisons, sur Deer Valley Drive. Nous pouvons accueillir 2 - 6 personnes confortablement. Deer Valley a remporté de nombreux classements n ° 1 de SKI Magazine ... toiletter pour zoomer, nous attendons de le partager avec vous. Master Bdrm + Salle de bains privative: Lit king très confortable, télévision à écran plat, double vasque, combinaison baignoire / douche. Spa: privé. Apportez un verre de vin et admirer la vue. Voir: Amazing! Notre point de vue est un coup de pouce constante d'être ému par la beauté de la nature. Nous sommes au premier rang de la promenade Deer Valley et avons une vue sur les étangs inférieurs de Deer Valley Resort. Infos sur la navette: gratuit. Les navettes Deer Valley Resort et Park City s’arrêtent devant notre propriété. Park City Infos: 1 mile bas Deer Valley Drive est la rue principale historique de Park City où vous trouverez une délicieuse gamme de restaurants de classe mondiale, boutiques, clubs et galeries d'art. L'Egyptian Theater est un point de repère Sundance et met en valeur le théâtre en direct. Deanna was so wonderful to work with, she gave us lots of tips. The condo was well stocked and very comfortable, not to mention the great location! Hi Leslie, that's my #1 goal, guest satisfaction. Very happy your family was comfortable in our home. Hope to have you again next season! We've been regulars here and love it. It's spacious, always clean, very accessible on the bus line just across the easy street, and the owners are incredibly responsive. The furniture is very comfortable, especially after a long day of skiing. The full kitchen is completely equipped, and everything works. Great for saving some on breakfast, whether it's time or money!! We cooked dinners as well, and really enjoyed the large range of utensils and pots and pans. Great living. Garage is great too, for driving without having to clear the fresh powder off the windshield. Big views across the center of Deer Valley, an easy few minutes to snow park. Plus, you don't deal with the extra altitude that is at silver lake village. All in all, it's great. Thanks for letting us stay!! We have stayed here 4 years in a row and just love it! You can't beat the location or the amenities. 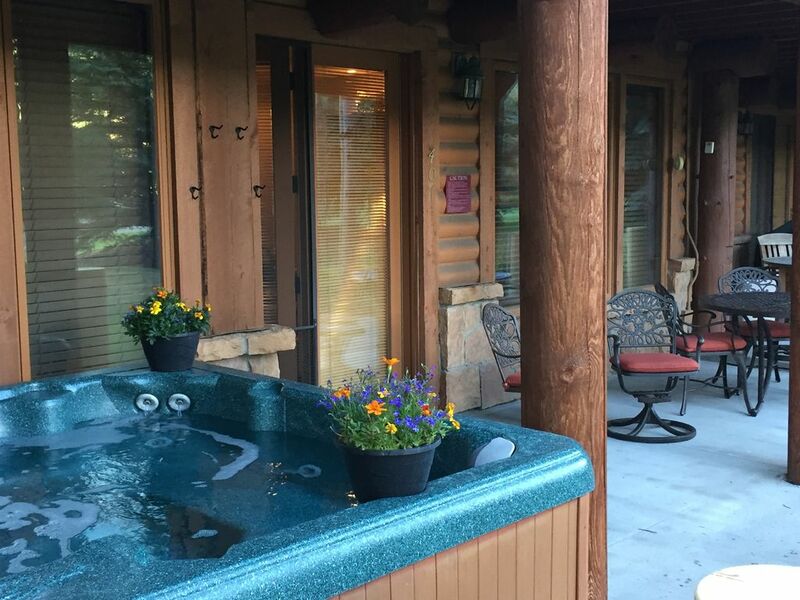 This condo has everything you need...two spacious bedrooms, nicely remodeled bathrooms, laundry, a great/fully equipped and remodeled kitchen/living space, a fireplace, a private hot tub and beautiful views of the mountain. And it is quiet and private. It has been the perfect spot for our family of 4. And above all, the owners have been such a pleasure to work with. They truly make you feel comfortable in their home, and do everything they can to make your stay enjoyable - so many nice little extra touches. We will for sure be back again next year! And we love having you guys, L and M! If we treat you like family it's because we respect the fact that your vacation matters. You've given us 4 opportunities to show that we aim to deliver a perfect 'home' experience, and we've hit the mark 4 times running. Thanks for choosing us again, see you next season! Perfect condo for our young family! Perfectly sized and located condo for our family of four, including jacuzzi for after skiing, open area for snow play, and quick bus ride to ski school at Snow Park Lodge. We loved the kitchen, three TVs, comfortable beds and furniture. The owners, Deanna and Peter, are quick to communicate and extremely helpful. Will stay here again next year! We'll be ready for you, C and J. We're happy the across-the-street shuttle stop was so convenient for getting the kids to and from ski school each day. An effortless trip is what we want for our guests :) So happy our plumber was able to get there same day to change out the shower cartridge - we very much appreciate you calling that to our attention. Welcome to the family! We had a lovely time. The kitchen is modern and all the appliances work and are well supplied. There is even a washer and dryer, so you can travel a bit lighter and just do a wash midweek. The beds are clean and comfortable. Everything is comfortable, clean and works wonderfully well. There is cable TV, stereos, great storage, and an easy access to the mountain on the public bus right outside. or by car...even has a garage with door opener. Very comforting to sit in front of the gas log fire and relax after a day of skiing. We have been here often and plan on coming again. Extremely proud to be your mountain home of choice, R and W. We know your standards are high and we're happy to consistently be meeting them. Looking forward to hosting you for many trips to come. Perfect condo! Very clean and tastefully decorated. -Guests can pay in 3 payments depending on how early the reservation is made. Please ask us! -The damage deposit is refundable pending a favorable inspection by our cleaning crew. -For extended stays of 30 or more days, the damage deposit is $500 -We have a short 'please do' list on the refrigerator asking that you take the sheets off of all beds, throw out any refrigerated foods you're not taking with you, and take out your last bag of trash.